The Thing | WHAT A FEELING! This entry was posted on Wednesday, February 16th, 2011 at 4:00 am and is filed under 1982, Actually Good 80s Movies, Horror, John Carpenter, Sci-Fi. You can follow any responses to this entry through the RSS 2.0 feed. You can leave a response, or trackback from your own site. THE THING de Carpenter is indeed a puzzling case. Your contemporaneous review, with which I agreed completely at the time, remains acutely accurate. Yet the movie definitely gets better, or is seen to be better, on repeat viewings. I guess it’s a variation on the adaptation syndrome whereby one who knows the original (or predecessors – e.g., TRUE GRIT book and movie) may need an initial viewing just to get the distractions of comparativeness out of the way. But even allowing for that, the progression from disappointing and seriously miscalculated THING 1982 to pretty engrossing THING 1982 to maybe even spellbinding THING 1982 with an integrity all its own is pretty well unique in my experience. That is a fascinating process. I think my re-see of the film was 2-3 years after it opened. Since that was a lifetime ago, I am well overdue for seeing the movie with fresh eyes and having the coin finally drop. 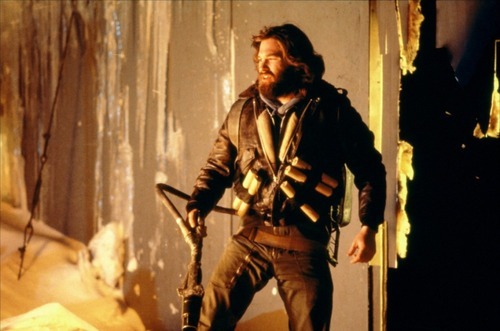 I must have a problem with re-visiting Carpenter, because a bunch of his films that I very much like and always intended to have the pleasure of seeing again I’ve never gone back to: THEY LIVE, BIG TROUBLE IN LITTLE CHINA,STARMAN. I even thought VILLAGE OF THE DAMNED had an interesting Polanski-like rhythm to it.